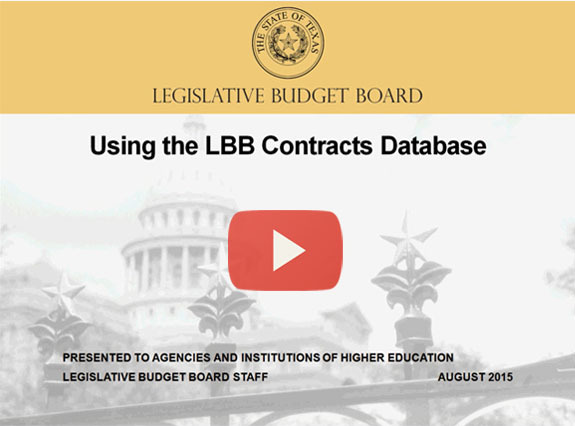 The Contracts Database is the single point of data entry for all contract information or contract documents that state entities are required to report to the LBB either by statute or the General Appropriations Act (GAA). The Data Dictionary defines the fields in the database and includes field names, data type, entry restrictions, possible values and a summary of the purpose of each field. Contract reporting requirements vary depending on contract type, contract amount and contracting entity. The LBB Contract Reporting Guide provides details on the types of contracts that must be reported to the LBB via the Contracts Database. The Procurement Monetary Threshold Document provides a quick reference to value thresholds by procurement type. The Detailed Contract Reporting Requirements includes excerpts from statute as well as hyperlinks to the various statutory provisions. The General Appropriations Act includes additional reporting requirements. 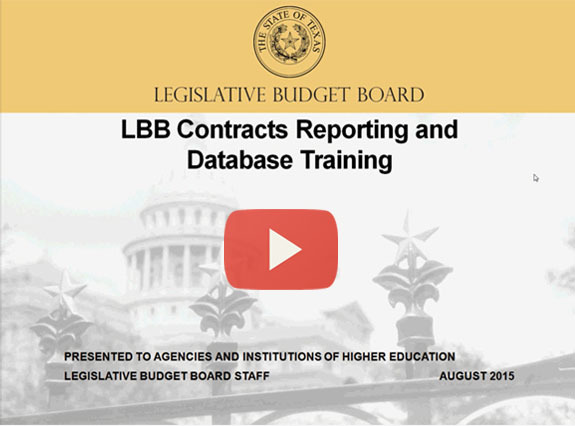 State Contract Reporting(Instructions for State Agencies of Higher Education), provides detail on data entry and record updates. The Quick Start Guide is a fast way to orient users with the data entry screens. The Attestation form is the electronic version of the executive letter that must be reported to the LBB for contracts subject to reporting under the General Appropriations Act, Article IX, Section 7.12. The Transition Guide summarizes steps agencies and institutions must take to update records that were transferred from the old database to the new for contracts that are effective in fiscal year 2016. The New Interface User Guide describes how to use the new Contracts Database interface, including searching records, submitting new records, and amending existing records.